Click here for a pdf of our plan. The purpose of this Initial Disaster Preparedness Plan (IDPP) is to state CBF of Florida’s plans towards how it will respond in the aftermath of a disaster. The Cooperative Baptist Fellowship of Florida will strive to support and equip CBFFL churches and members to adequately respond to assist in the aftermath of a disaster big or small. CBFFL will seek to empower its churches and members within their given capacities. CBFFL will seek to provide aide within its defined ministry scope as dictated by the invitation of the local church. CBFFL will constantly evaluate and update its resources and capacities as determined by its active participants. CBF of Florida will strive to coordinate the efforts of its people and churches to efficiently and effectively respond, both within Florida and, along with other state and regional CBF organizations, to other states/regions as needs dictate and requested by state/regional CBF leadership. Initial strategies will include, but are not limited to, 1) determining needs of effected church and its members; 2) determining response to assist church in helping its members and community; 3) coordinate efforts of sister churches and partnering groups; 4) make available resources as they become available. Resources may include, financial grants, gifts in kind (food, water, tarps, etc.) and distribution of same, manpower, Recovery Operation Center administration, Communication Trailer, Shower Trailer, Response trailer with equipment, and teams from within Florida and from other states. These strategies and any others developed in the future will be offered to neighboring states at the invitation of the State or Regional CBF leadership of said state or region. We will look strongly to volunteers among our membership to give leadership and guidance. A Volunteer Disaster Response Coordinator (DRC) will be enlisted who will work in conjunction with the Coordinator and/or Associate Coordinator. The DRC will help in recruiting and enlisting churches and members to serve in the various capacities of response. Each church will be asked to designate its own Church Disaster Response Coordinator (CDRC) who will guide the church in its response to its members and in any efforts to send aide to others. The Church DRC will serve as the contact person for the CBF Florida Volunteer DRC to communicate needs and response requests to and from the churches. A team of volunteers from around the state will be asked to serve on the DART Council. The DART Council will serve as the leadership group working with the Volunteer DRC and the Coordinator/Associate Coordinator to give leadership and decisions in planning, promoting and training members and teams. Individuals who can serve on an Advance Team will be needed to be ready to go to an area immediately preceding an event to determine the magnitude of response needed and to begin to coordinate efforts among sister churches, neighboring state CBF organizations and partnering agencies. The CBF Florida office will receive funds designated to assist in response to disasters. They will be forwarded as designated by the donor or pooled with others’ contributions in the designated account for Disaster Response. These funds may be dispersed in whole or in part at the direction of the Coordinator or Associate Coordinator, the DART Council, or other designated member of CBF Florida and its leadership team. Reports will be made readily to all inquiries and to the Administrative Council of CBF of Florida. GIFTS IN KIND(GIK) — One of the first reactions of people to help after a disaster is the impulse to send something to the victims. Many times these items are perceived to be needs, but may not be what victims need. It will be the intent of CBF of Florida to communicate as soon as possible the specific items that have been requested by our contacts in the affected area. We will discourage the sending of any item not requested. As we have learned from previous disasters, unless specifically requested, clothes will NOT be sent. COMMUNICATIONS TRAILER — A fully-equipped communications trailer has been made available for our use by First Baptist Church of Tallahassee. David Merrill and others have equipped this trailer with UHF and VHF radios, both mobile and handheld, cell phones and satellite phone, as well as a telescoping antenna. This can be a valuable asset in areas where local communications have been interrupted. This, too, will be available to respond to assist anywhere it is needed. EQUIPMENT RESPONSE TRAILERS — We have two 6 x 12 foot utility trailer equipped with chainsaws, shovels, tarps, nails, generator and safety equipment. One is kept in Lakeland and can go anywhere in Central and South Florida. The other is in Pensacola and is available for North Florida, the Panhandle and neighboring states. SHOWER TRAILERS — Nothing is more welcomed than a nice shower after a long day of work in a disaster area. Bayshore Baptist Church in Tampa has already stepped up to the plate and has a Shower Trailer in service. CHILD CARE TEAM — South Venice Baptist Church is developing a team of volunteers who will go to an area where others are serving to offer child care for victims so that small children can be cared for while the parents and older family members can begin to “put life back together.” This team will work within the capacity of a local church and at their invitation. One final note on all of this: Even though the “inventory” of items listed above has come about with disaster response in mind, each of these could be used by a church or partnering group during “off-season” times for camps, mission projects, etc. CBF of Florida partnering churches should begin to consider how their facilities could be used to house volunteers who come in to their area to serve. Consideration may be given to using the church facilities and/or offering rooms in members’ homes. Others may be willing for RV parking in the church parking lot. Volunteers may be needed in all areas where CBFF is attempting to assist. Each site and area may have different needs that should be addressed. Individuals with varying skills, trained and untrained. More skilled to temporarily weatherproof roofs, chainsaw work, etc. Training is essential for skilled tasks and no one should endanger themselves or others by attempting to do something they are uncomfortable with or do not know how. No one should feel they cannot be of service; there is always something that everyone can do. 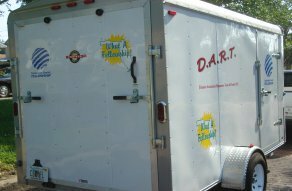 If willing and able to volunteer for CBF of Florida’s DART team in any capacity, please contact Ray Johnson via email or by calling the CBF of Florida office, 1-888-241-2233.